Washing cars is a standard part of rental operations. But washing clothes? That’s just part of the job for one Houston employee who went above and beyond for a customer in the aftermath of Hurricane Harvey. Harvey’s stats are staggering: 8,500 recues by the Texas National Guard, more than 50 inches of rain, 28,000 square miles of flooded land (that’s the size of Lake Michigan) and more than 32,000 people displaced from their homes. Equally as astounding is the exceptional, compassionate customer service Louise B. displayed in the wake of the storm. We talked with the Regional Account Manager to learn more. We’ve seen pictures in the news of Harvey’s destruction. Tell us about your experience living through the storm. It was overwhelming. The pictures do not do it justice. I’m in Beaumont, just outside of Houston. It was one of the hardest hit areas. You didn’t know if you would wake up and your house would be flooded – that’s a terrifying feeling. I have friends who lost all their possessions and that is devastating. My family was fortunate because we didn’t flood. What amazes me is how the community came together. People came from everywhere to help those in need – they brought their boats and helicopters. I’m proud to be a part of this community. Tell us about your unique interaction with a recent customer. I recognized an Allstate insurance adjuster who came into a branch wanting to trade out his rental car for a larger vehicle. I struck up a conversation with him and found out he was living in the car while in town for work since there were no available hotel rooms. He said he would go to a local gym to take a shower, but had no place to wash his clothes. I didn’t hesitate at all when I told him I would wash his clothes for him. He accepted my offer. He was surprised but incredibly grateful. I told him if the clothes were in by 5 p.m. they would be ready by 9 a.m. the next day. So far, I’ve done three loads of laundry. I also offered to help any of his colleagues. That’s just my way – I don’t shy away from helping someone in need. Since that first load of laundry, we’ve become fast friends. I’m certain when he returns home to Phoenix he will always remember Enterprise. What’s your secret to providing exceptional customer service? I’m always myself. I make friends with all my contacts, and that’s how it has been for the past 33 years. When I create friendships I’m also establishing trust. Customers know whatever needs to be taken care of, I will handle it efficiently. Hard work is also a key part of providing great service. 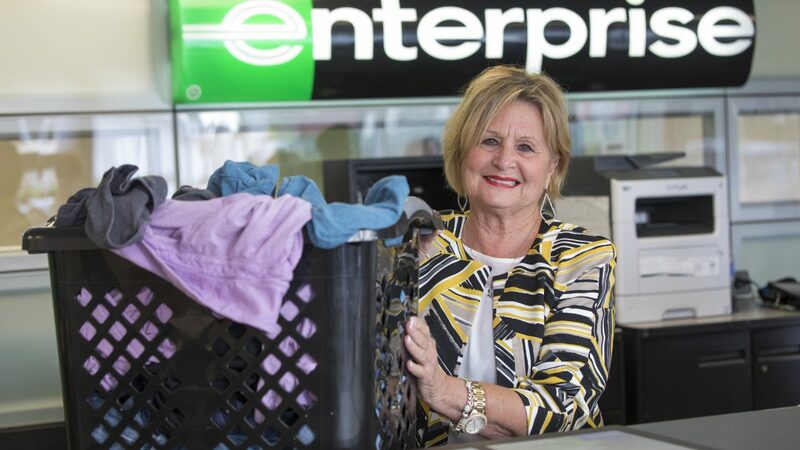 I’ve been in the rental car industry for 33 years. I joined the Enterprise team in 1997 – Nov. 1 marks my 20th anniversary. I’m part of the Replacement Rental team and have been in the same position in Beaumont, Texas since I began my Enterprise career. It’s the incredible friendships I’ve established that keep me at Enterprise. It’s truly a great company to work for.